We finished again! That was even more of a feat than usual thanks to a complete lack of testing or practice! 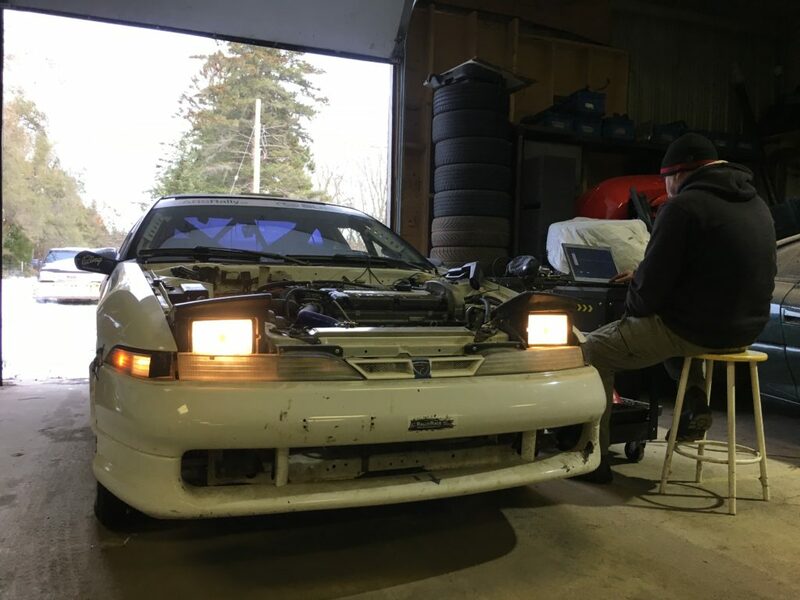 Which – spoiler – means we got the car built and running. If you’ve been keeping track and wondering what we’ve been up to since our last update in August (100 days until Pines) – well, a little more than 100 days later you have your answer. We managed to get small bits of the engine testing and install done over the warm months but around the middle of October we said goodbye to our families, quit our jobs and started to work on the car. Ok no but it felt like that was going to be required. 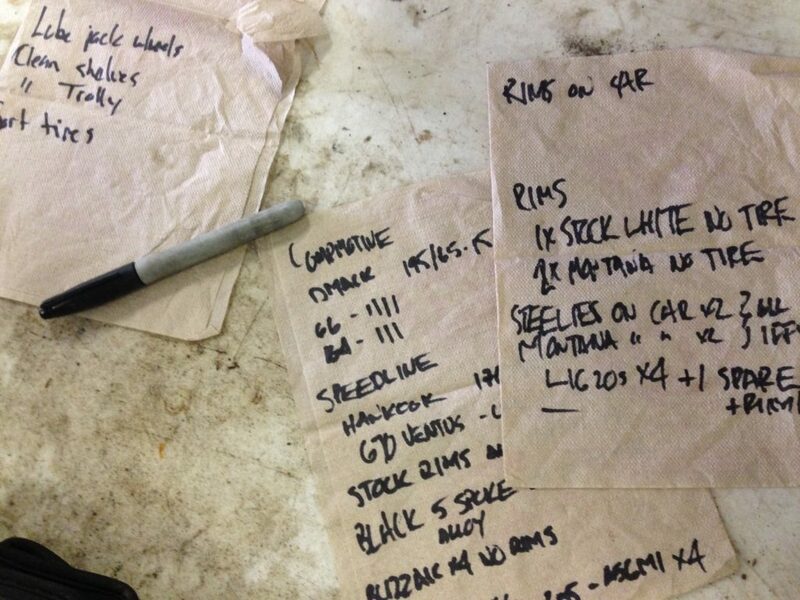 Here are some of our lists. We replaced the broken wheel stud after un-siezing the rear caliper mounts and not breaking anything else, which was remarkable. More on the rear caliper mounts later. We took the DMS to CanJam who got it rebuilt for us. We eventually got the CV boots and clamps we needed and got that all put together, but it took more than one try because DSM. We replaced the brake line that was ‘kinked’ as well – seemed like luxury but why not. We then hooked up all the coolant-related hoses and the electricity hoses, we put oil in the spots where oil goes, and then we tried to start it. Then we found out that our $300 Optima battery was toast so we got to return that under warranty. And when we replaced it the rebuilt motor ran! But not really well. 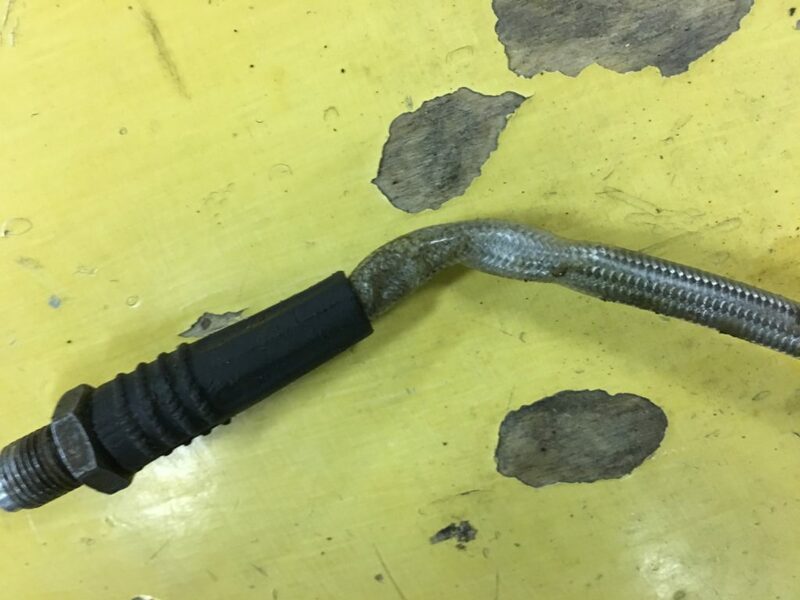 The first problem was the alternator belt got eaten immediately. We relocated the alternator and to do that we needed to build spacers for the mounting bolts. Well it turns out they are like 1⁄4″ difference in thickness between top to bottom spacers…and we put them in the wrong spots, so the alternator belt was slightly out of line, so it got eaten. And we got to pull the alternator off and install a new belt. Which solved that problem, but then it still ran kinda rough. So we worked on timing for a while, which didn’t go well until we realized that we had the timing light on the wrong cylinder wire. Then it went better and we had a driving car. That meant we could drive it over to the hoist to bleed the clutch, which on the DSM is a pain. It went well in that we got all the air out, but not well in that the clutch was still not really working and shifting was very crunchy. We tried bleeding it more, but that seemed fine. Then we tackled the adjuster under the dash, which is a huge PITA to get at…but it turned out that fixed that problem. So our big concerns – timing and clutch – were resolved more than a week before Pines, which was better than we expected. That plus some insurance meant we could drive it, so after a couple of runs up and down the road we took it to…the car wash! Where we were headed 357 days earlier. Then we drove it to the bar. Still no leaking or dying or really strange behaviour. Which in itself is really strange behaviour. And yes, all the fluids were still full. We know that trick. A drive to Schomberg and back was 100km, which we figured was enough so we pulled the break-in oil out and put in the Amsoil race oil from Paul at www.hslrallysport.ca. We also put some zip ties through the pate with all the electrical switches in it, put the fancy new race car steering wheel in, packed a light in the trunk for night-time tire changes, and picked up the A034 race tires from CanJam. Oh and the new wheel has a horn! So that was the prep. The race also went better than expected – yes the above constitutes “better than expected” for us – in that we finished. And apparently got a prize! 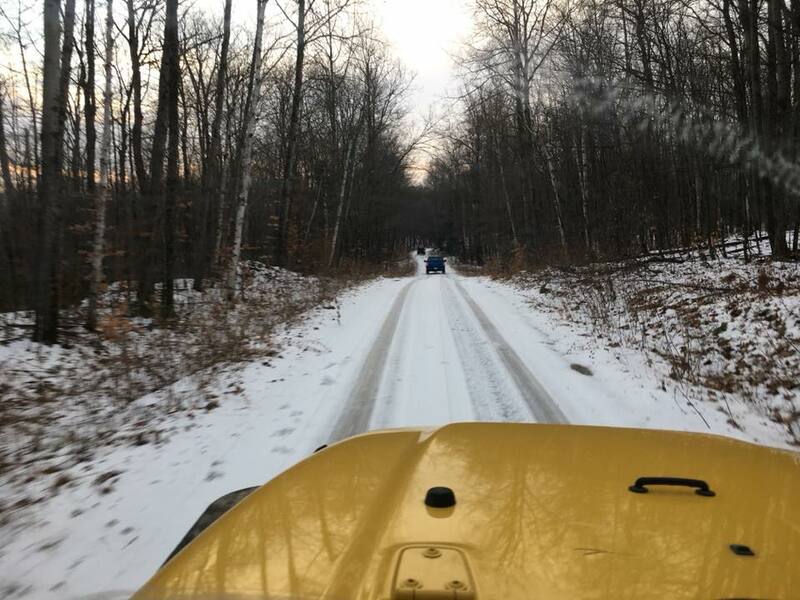 We stayed in the usual cottage and used the usual Jeep for recce, because we learned after the 1wd Volvo fiasco that for recce it is better to go slowly down icy forest roads on mud tires than to be stuck at the bottom of a hill at the start of a stage. The notes went pretty well because we have done most of these stages with The Manchurian in the past, so in theory we were just fine tuning them. Apparently we need to re-define “fine” tune but in the end it seemed to work out pretty well. 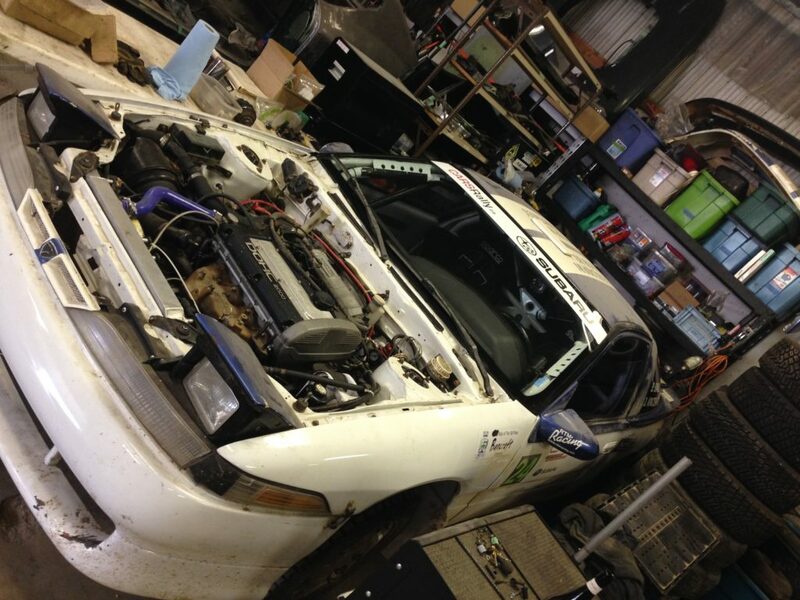 Ryan from Rally/Race Development hauled the car up and Drew met us there to complete the crew. The car was ready and running pretty well, although the lack of a working idle controller meant that it had a really annoying surging idle. That got old quickly through the day. The biggest question was tires, because on the Friday it was ice and snow in the forest while the ‘town’ roads looked like a repeat of last year, i.e. mud on top of ice. This was proven when people were going off the road in the mud during recce. We had decided to buy some not-very-secret weapon Yokohama A034s, which look like the below (thanks 2 Brits for the picture). Essentially they are what we tried to make by cutting snow tires last year, except they work WAY better. However we only had 5 – cursed budget and lack of rims – so we were hoping to not destroy any. 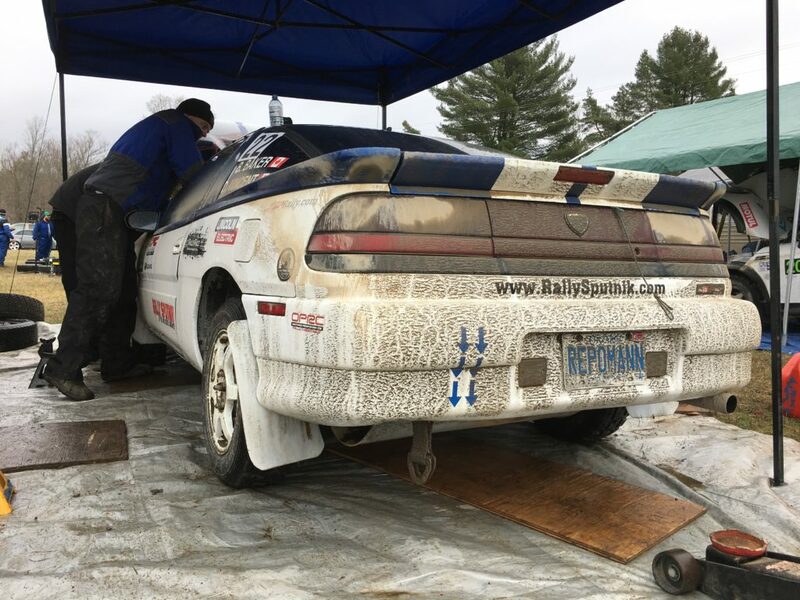 The first stage was a bit of a hail Mary, in that we didn’t know if the car would blow up or have parts fall off plus we hadn’t driven in a rally or heard or called notes in exactly one year. 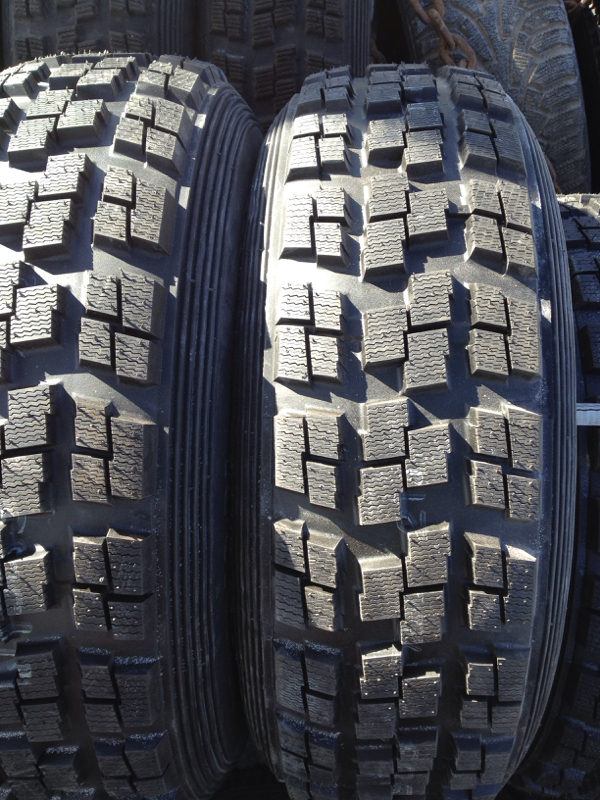 We also chose to run gravel tires because it was above zero and lightly raining and as noted we didn’t want to destroy or wear out the A034s. However gravel tires are garbage in snow and ice so we were unsure if that was wise or not. All in all a bit sketchy, but thankfully we have experience with sketchy. Also thankfully – oh yea – there’s video of us trying to figure out how to rally again, and you can see that below. So from there on to stage 2, where we encountered our first ever fire/medical emergency. That was pretty scary although fortunately everyone turned out to be fine, so that stage and the next were scrubbed. After that things seemed to fall into place a bit better, although we had some of the usual struggles with getting off the notes. And a few spots where we got lucky with a ‘moment’ that worked out in our favour. Of note was Old Detlor (which is called Egan Creek in the video); it featured really slippery mud followed by really slippery snow and ice. We stopped to pull someone out here and still had a pretty good run! We also pulled someone out on the actual Egan stage and still had a pretty amazing (for us) run though because just as we exited the forest we bounced off what looked like a rock and heard a very loud bang, after which the car started to veer wildly and make a loud grinding noise. Sounded like a flat so we crept along at 60kph on the very fast, wide, fun bits. Dammit. At the end though, everything looked ok, so we carried on to Lower Hastings. 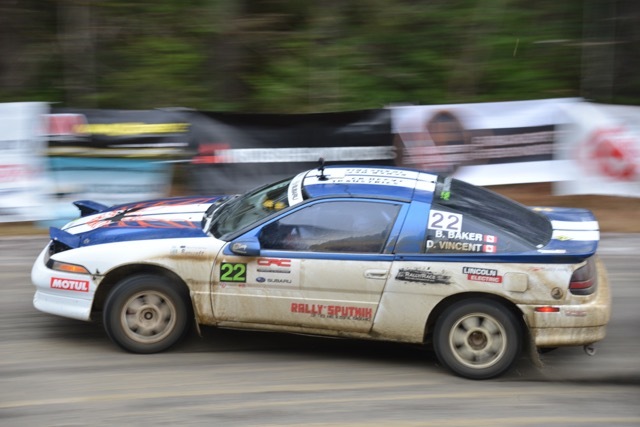 The car was better on the transits so we figured we’d carry on and maybe back off a bit on the dark Hastings stages in order to finish…which was the same scenario we had her in a previous year. However, that thinking lasted about 1 km into the stage – the car seemed fine so we channeled our inner Bon Jovi and went for the blaze of glory scenario. Despite some strange brake noises and twitchy behavior we were fine, so we did the same on Middle (which is called Upper in the video title. Yeah, yeah, something something drivers something). Since the e-brake didn’t work at all and the car would slew sideways when on the brakes it seemed prudent to avoid using them much. Here’s what that looked like. That was all followed by the lunacy that is the Goltan stage; somehow we place top 1⁄3 on that stage every year despite basically taking hands off the wheel and mashing the gas without notes. And we finished! How did we do? Well you would ask that. The answer is…it’s complicated, but we were happy. Really? Ok fine. We entered the Regional rally, which means we run the same set of stages but then the National folks do 4 more stages, so there’s no point in saying how one did “overall” unless you do the National. 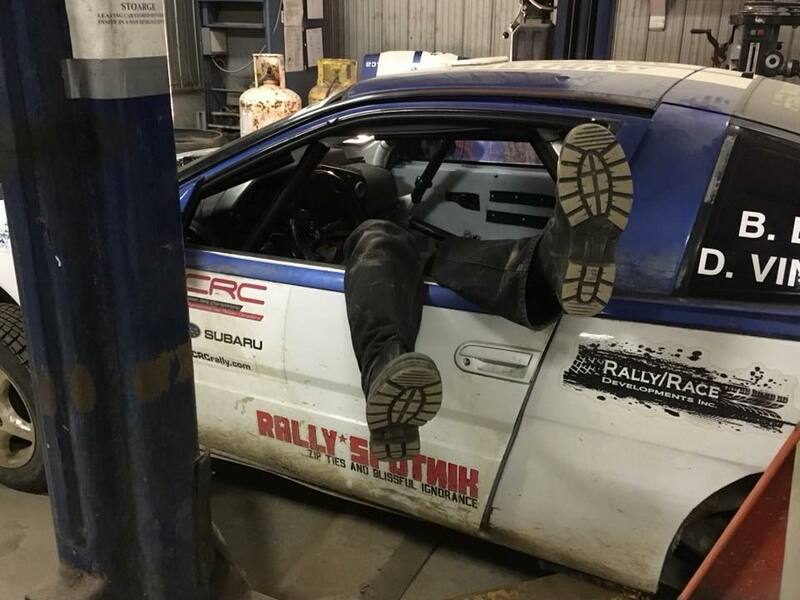 But in Regional (which is the Ontario Performance Rally Championship or OPRC) only we came second. But people can run both the Regional and the National, so in overall Regional we came 6th and 3rd in Production 4 (which means all wheel drive). 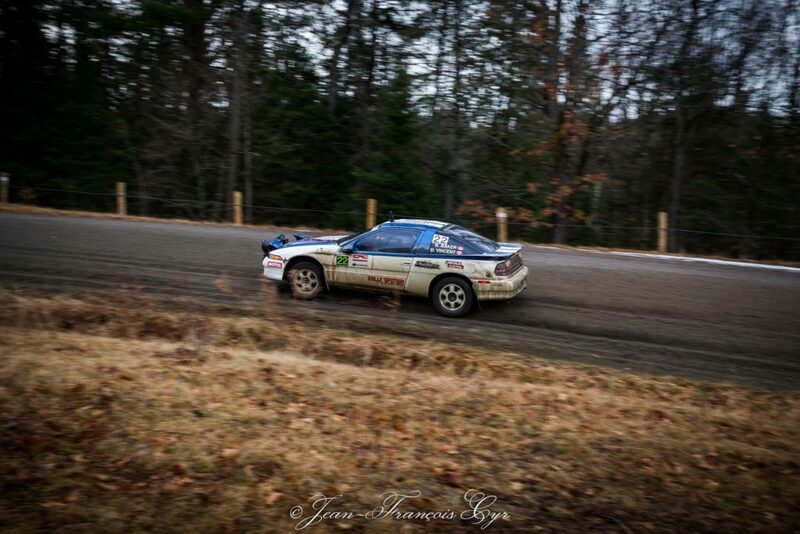 In the Eastern Canadian Rally Championship (or ECRC) we also came 6th. 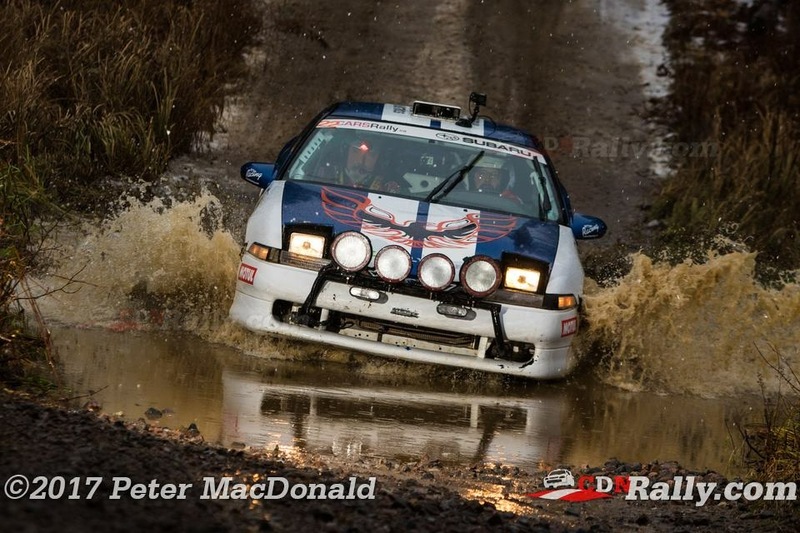 And on Middle Old Hastings – and Golton – even with 3 brakes we were 9th on the stage overall, which made us happy. Here’s what the rear brakes looked like after the rally. So in short (ha too late!) 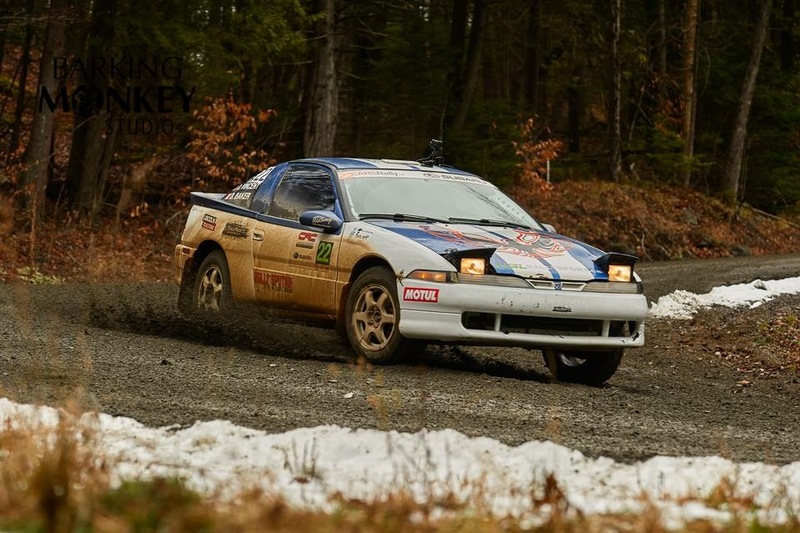 with no vacuum leaks and a rebuilt motor and everything put together properly and a proper rally suspension and proper rally tires the car has potential. Which we knew but hadn’t been able to prove. And us, well, maybe there’s hope for us too. To find out we’re aiming for Peirce Neige, so hope to see you there. Some action shots are below, all copyright their respective photographers.